Country radio may not play them, but Whitey Morgan and the 78’s are finding their way to the people nonetheless. It’s always fun to witness a cool convergence of sports and music, and to find out who is listening to what. The Turnpike Troubadours owe some of the popularity of their song “Long Hot Summer Day” to baseball player Matt Carpenter who took it all the way to the World Series, and it should be no surprise there’s a mess of NASCAR drivers that are into country music, from the Bro-Country crap to the real stuff. But crossing the finish line and coming in first for the coolest taste in music on the circuit has to be Kyle Larson. Kyle Larson’s message is loud and clear: the world needs more Whitey Morgan and the 78’s. 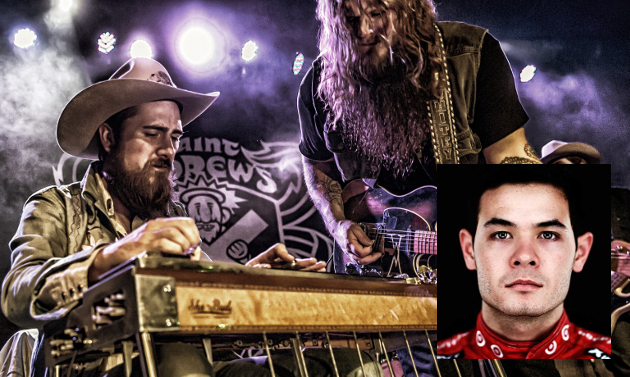 Even more interesting, this weekend’s race is the second of two annual NASCAR races at Bristol, and at the previous race on April 17th, Kyle Larson was introduced via Chris Stapleton’s “Outlaw State of Mind.” Good taste in music, indeed. And don’t diminish the importance the Bristol fans take in Shazaming and sleuthing out what song each driver is introduced to. One interesting footnote though, whomever is putting together NASCAR’s official master list of driver introductions in Bristol may be having “Another Round” too many. Whitey Morgan and the 78’s are misspelled “Whitney Morgan and the 78’s.” But that’s not half as bad as Eric Church, who is misspelled as “Erica Church” on the same list along with some other humorous typos. Either way, hopefully it’s an opportunity for Whitey and the boys to be exposed to a few more folks. Footnote: To many, Bristol, Tennessee is considered the true birthplace of country music. Ralph Peer’s Bristol Sessions in 1927, recording The Carter Family and others resulted in the “big bang” for country music becoming a legitimate art form and a commercial enterprise. As a NASCAR fan, I am happy you posted this article as when I saw it was I going to find a way to let you know. Kyle is one heck of a driver and really neat he picked that song!! Funny story – I took my brother to see Whitey and crew in Atlanta a couple of years ago and he had never heard of them. He “googled” them ahead of time to get familiarized and ended up on Miss Whitney Morgan’s website, “Orlando’s premier fetish model”. Obviously he was a bit disappointed when he found out we were just going to see a country band (lol). And for those who are looking at product positioning – “Outlaw State of Mind” closes the best movie I have seen so far this year, “Hell or High Water”. 1) It sounded tremendous on the theater sound system and 2) it fit absolutely perfectly with the scene/situation and 3) go see the d*&n movie! I like this too. Been getting into Whitey and like most everything, especially the live album. Anyone know why his stuff isn’t available until 9/9 on Amazon? Not sure what you mean. Whitey’s stuff is available on Amazon. “Pre-sale” – not shipping until 9/9. Yeah, but my problem was the Stapleton song was the weakest song in the film. The movie kicks off with Townes Van Zandt and includes Ray Wylie Hubbard, Waylon, and a score by Nick Cave. I thought ending the movie with an artist more along those lines would have been better, like a Guy Clark, a Joe Ely, or Terry Allen. Plus, the song used, “Outlaw State of Mind”, I feel is the worst song on Traveler. It’s the closest to Bro-Country and even approaches Brantley Gilbert territory. The only time Waylon sang about Outlaws was in a self-effacing way. Those guys didn’t need to brag or chest pound. That brings me to Whitey. I think what he does is fine for what it is. But I feel what it is is more like a tribute to the Outlaw sound. Granted, he has impeccable taste, covering Waylon, Townes, even Frankie Miller on his latest album. But his originals need more work substance-wise. Until then, I’d rather hear the real thing. Been trying to run down an official soundtrack for this. Hope to have a story soon. Hey Trigger, I actually work with Larson and helped him pick out that song. He’s a fan of country music for sure, and really likes Sturgill and Stapleton, so I thought introducing him to Whitey Morgan and the 78’s was a logical step. Kyle will be running a car with some country ties at an upcoming and I’d love to share some pics with you for this site. Email me the best way to contact you and I’ll shoot some info your way. I was there and I noticed the inclusion of a true country song by Kyle Larson. I thought that it sounded like Whitey. A singer named Ray Scott did a pre-race concert. Ray Scott is from my neck of the woods and I’ve opened a show for him. He is an amazing songwriter that deserves much much more attention. Maybe some website dedicated to preserving authentic country music will feature him in an article. I was thrilled the other night at the race when I heard whitey morgan during the introductions… too bad we only saw 38 laps before the sky opened up and it rained out. Larson is also running a Marty Robbins tribute paint scheme in the Xfinity series race at Darlington on Labor Day weekend!